Depending on the century you are talking about over the last two thousand years or so, Naples and the Campanian coastal approaches have had a wide variety of defensive fortifications. They range from the relatively small Saracen Towers (photo, right; also see this separate entry) to massive Castel Sant’Elmo, which still today sits above Naples. In between, there are fair castles to middling “plantations” armed to the teeth (more, below). Much has fallen to ruin, but some of it is still visible; indeed, some of it was of important strategic value until relatively recently. The castra (plural of castrum) were Roman forts. The most important ones near Naples were built as the area was gearing up for the agonizing Gothic Wars that devastated much of Italy following the fall of the western Roman Empire. In the Campi Flegrei (the area of Pozzuoli) there were three important ones: (1) the Castrum Misenati, on Cape Miseno; it was destroyed by the Goths, then rebuilt by Pope Gregory the Great in 599 and destroyed again by the Saracens in the 800s. No trace remains today; (2) the Castrum Cumanum, built near the Cuma acropolis; it survived until 1207 when it was destroyed by a Neapolitan raid. 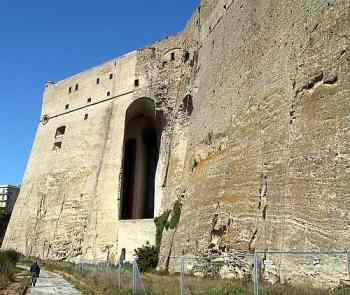 Some remains can be seen today; and (3) the Castrum Puteolanum on the height of the Pozzuoli Rione Terra, the old city. There are some traces of the fort, but not many, although there is significant archaeology in progress in the area. Other examples of Roman castra that have not survived at all were the Castrum Gipeum on the isle on Nisida, the Castrum San Martini in what is now the center of the town of Monte di Procida and the Castrum Tripergularum at Lake Lucrino; both the castrum and the nearby town, Tipergole, were destroyed in the eruption that formed a new mountain—Monte Nuovo—in 1538. While the castrum (fort), or even the larger fortress, was, strictly speaking, only a military garrison, a medieval castle was a large, solid, fortified structure built as a garrison but also as the residence for the lord of the castle as well as for the surrounding populace, who could be sheltered within (Sant' Elmo castle, photo, left). The Normans and Hohenstaufens perfected the art of castle construction in the area. A notable castle in the Campi Flegrei is the so-called Belvedere Castle (aka Castle Monteleone) on the rim of the Quarto crater on the road to Marano. It was built by Frederick II in 1228. It fell into ruin and was restored by Charles of Anjou in 1276. It served as a hunting lodge for the king’s guests. It was restored in the 1500s but eventually fell into ruin, Today, it has been subdivided into apartments but the plant of the original building is intact; it was a rectangular structure, 37x40 meters with 6 towers along the perimeter, two large ones facing inland and the others facing Quarto and sea. Also, the Scilla Castle on the Camaldoli hill was built at about the same time by Charles of Anjou in 1250; it has the same dimensions as the Belvedere Castle (mentioned above). Modern construction has rendered most of it unrecognizable, but there is still a chapel, restored in 1899. Farther afield to the east, at other end of the bay, is the castle of Lettere, currently undergoing restoration. It is near the site of the Battle of Mons Lactarius in 553, marking the final defeat of the Goths in Italy. The castle is somewhat later; it was built in 900s as a bit of “good fences make good neighbors” policy to separate the Duchy of Salerno from the adjacent Duchy of Benevento following a civil war that further subdivided the old Longobard holdings in the south. 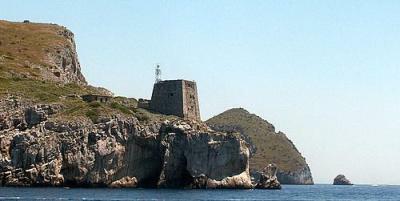 The structures still called “castles” in Naples are the Castel dell’Ovo and the Castel Sant’Elmo. The former has a very long history; the latter goes back to the Angevins but was massively reconfigured by the Spanish under viceroy Toledo in the 1530s. Even today, if you stand outside the walls and look up, it’s impressive. Toledo also rebuilt the Aragonese fortress at Baia. It has been restored and is open to the public. After the eruption that formed Monte Nuovo near Pozzuoli, Toledo also built a grand park with gardens in order to convince the frightened population to move back to the area. It included a massive defensive structure called Torre Toledo. There were three stories above ground and one basement. It later became a Bourbon jail and then a civilian hospital from 1870-1970. Today it is a ruin located on the premises of the Villa Avellino in Pozzuoli. Perhaps the most enigmatic of the structures that one sees today, especially to the casual observer, are the case-torri (lit. “home towers), which I have rendered as “plantation tower” in order to give an idea of why and how they came into being. The Aragonese and then the Spanish broke feudalism in the south in the late 1400s through the 1600s by forcing the barons and lords of the castles in the outback to move in closer to the city (Naples). There then arose the need for a new kind of fortification for those left behind, those who cultivated the land and who were now left without feudal protection against the new “post-pirate” threat—banditry. The towers were “castles” in the technical sense: you could withdraw within and defend; they were forts as well as living quarters for the defenders—not soldiers, mind you, but well-armed citizens. There were a lot of those and some of the towers are still standing. The best known “casale” tower in Naples is the Torre Ranieri at the end of via Manzoni in the Posillipo section of the city (photo above, right). The neighborhood around what is left of the structure is also named Torre Ranieri. It was a square structure with a “shoe” base, that is, a base high enough to contain living space, then “stepped up” to further space on top. There were two floors in the base and two on top. It takes its name from the family that built it, at the time (around 1600) large land-holders in the area. It has been rebuilt a number of times and is now owned privately. At the other end of the long via Manzoni, near the crossing of via Caravaggio, there is also the lesser known Torre Cervati, of which there are still bits and pieces that have been incorporated into surrounding modern structures. -Cesare De Seta, Le Città nella Storia d’Italia: i Casali di Napoli, editori Laterza, Naples, 1989.